Turkey: Erdoğan's Unofficial Paramilitary Groups to 'Monitor' Elections? 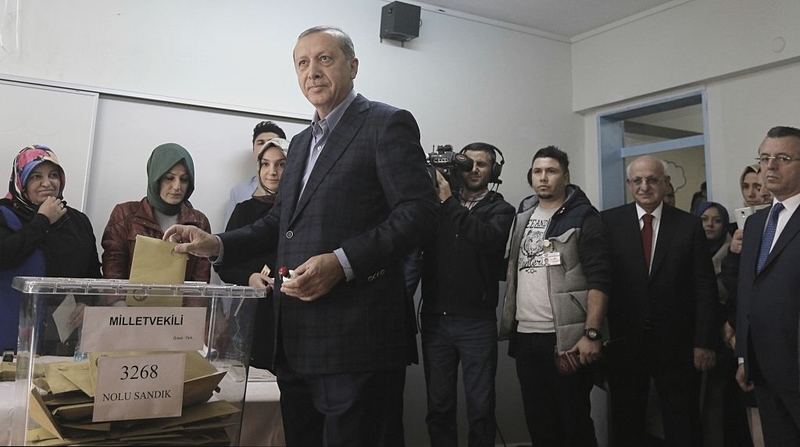 The memo, sent by the Turkish Interior Ministry to the country's governors, states that in the March 31 elections, in addition to police and security officials manning the polls and taking the necessary "precautions required for election security," there will also be "volunteer security guards" involved. The reason this announcement is worrisome to opposition activists, among others, has to do with what they suspect is the nature and makeup of these "volunteers" -- particularly with rise of unofficial paramilitary groups connected to the ruling Justice and Development Party (AKP) of Turkish President Recep Tayyip Erdoğan. A Turkish government memo related to the upcoming mayoral elections in Turkey is causing deep concern among oppositionists throughout the country. The memo, sent by the Interior Ministry to the country's governors, states that in the March 31 elections, in addition to police and security officials manning the polls and taking the necessary "precautions required for election security," there will also be "volunteer security guards" involved. The reason this announcement is worrisome to opposition activists, among others, has to do with what they suspect is the nature and makeup of these "volunteers" -- particularly with the rise of unofficial paramilitary groups connected to the ruling Justice and Development Party (AKP) of Turkish President Recep Tayyip Erdoğan. One dissident author, İnci Hekimoğlu, likened the establishment of these groups to the Village Guards, a paramilitary force established in the 1980s by the Turkish military to combat the Kurdistan Workers' Party (PKK) insurgency in eastern Turkey. The Village Guards, which are still operating, have committed innumerable human rights abuses against Kurdish civilians. According to a 2006 Human Rights Watch report, these abuses include: "murders, rapes, robberies, house destruction, and illegal property occupation." Hekimoğlu warns that similar groups could soon be active across the country. One such organization, the Ottoman Hearths -- established in 2005 as a publication, then registered in 2009 as an association -- is accused of attacking the headquarters of daily newspaper Hürriyet in Istanbul, an office of the opposition Republican People's Party (CHP) in Ankara and dozens of buildings associated with the opposition Peoples' Democratic Party (HDP). The group's stated aim is to promote "Ottoman civilization and culture," a goal in line with Erdoğan's neo-Ottomanism. The Hearths' headquarters is decorated with Ottoman paraphernalia and photos of Erdoğan, to whom the organization pledges full loyalty: "Being a burial shroud-wearing soldier for the burial shroud-wearing leader," is one criterion for membership. The "shroud-wearing leader" is a reference to Erdoğan, who often reminds audiences during his speeches that he began his political journey with his shroud on -- symbolizing that he is ready to be a martyr for his cause. A video of a Hearths swearing-in ceremony shows new members using the same shroud reference. After an AKP election victory in Istanbul, several Ottoman Hearths members reportedly wore shrouds to greet Erdoğan. On January 12, Kadir Canpolat, the head of the Ottoman Hearths, declared: "The great chieftain Erdoğan, who saved our nation in every respect, is our mutual honor. Those who betray him, betray us." Canpolat was briefly detained in November 2006 as one of six suspects involved in a plot to kill Pope Benedict XVI during his visit to Turkey. Another suspect was Mustafa Öztürk, a friend of Canpolat's, who was also arrested during the investigation into the murder of Turkish-Armenian journalist Hrant Dink. In 2015, Furkan Gök, the head of Ottoman Hearths' youth branches in İstanbul, tweeted praise for the ISIS suicide bomber who carried out an attack that killed 33 people in Suruç. On December 12, Hearth members demonstrated in front of the Fox News affiliate in Istanbul against one of its anchors, Fatih Portakal, who had suggested that Turks might wish to stage "yellow vest"-like protests against rising prices. Just over two weeks later, a Turkish prosecutor launched an investigation into Portakal for "openly inciting others to commit a crime." Another controversial pro-Erdoğan group is "People's Private Forces" (HÖH). Established in the wake of the failed July 2016 coup, the HÖH is led by Fatih Kaya, a former Turkish army official, who said in an interview last year that the "most beautiful democracy is Islamic law." When asked about a 2016 interview -- in which he had mentioned joining the pro-AKP government fighters in Syria and saying at the time, "This [fight] ... is now a war of the ummah [Islamic nation] of [Islam's founder] Mohammed" -- Kaya said, "True." In February 2018, the "People's Private Forces" (HÖH) was closed and turned into a local association but in December, it reemerged with the same leadership as a nationwide organization under a new name - "the Platform for National Mobilization Movement" - whose aim is to "confront unlawful perceptions against the president and state officials." "When one looks at the examples of paramilitary structures across the world, one can see that the sovereigns in countries where fascism was on the rise escalated pressure and violence through paramilitary organizations in order to reach absolute power. The black shirts of the Mussolini era in Italy, the brown shirts in Germany and the Ulster Defense Association in Ireland... The regimes established on these structures wrought disasters on their countries and the world. They resulted in tragedies for humanity by causing the massacres of millions of people... Such associations and structures are making the public concerned... Are these structures being monitored? Are the authorities aware of what these organizations can eventually cause?" So, as of now, it looks as if the "security guards" will be gracing Turkey's upcoming municipal elections.